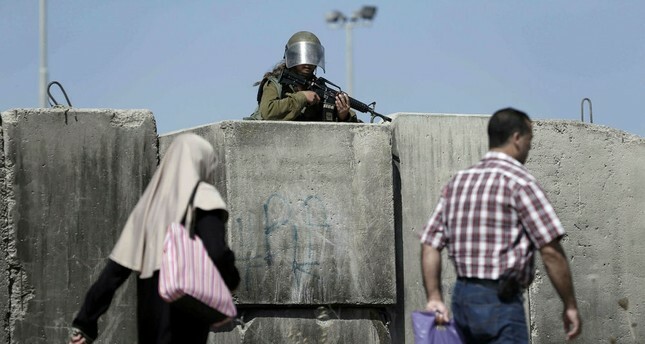 A female Israeli soldier stands guard at the Qalandia checkpoint, south of Ramallah, West Bank. Israel has reportedly banned the use of loudspeakers for adhan, the Islamic call to prayer, in a village south of the occupied West Bank on grounds that it "made Jewish settlers uncomfortable." According to Anadolu Agency, Israeli forces raided the village of At-Tuwani located south of the city of al-Khalil and banned the use of loudspeakers. The village had earlier been subjected to provocations by Israeli citizens and troops due to its proximity to the Jewish settlement of Ma'on. Currently, there are over 400 Israeli settlements in the West Bank. The international community, however, regards Jewish settlements in the occupied territories as illegal. Meanwhile, an Israeli official said Tuesday that the country was set to advance plans for nearly 4,000 new settler homes in the occupied West Bank as part of a push to greatly boost settlement growth. The approvals include units in the flashpoint West Bank city of Hebron for the first time in years. The official, speaking on condition of anonymity, confirmed that "3,736 housing units will be approved at different stages of planning and construction." Earlier, the Knesset approved in March a preliminary reading of a controversial bill that would ban the use of loudspeakers to amplify the Muslim call to prayer. In his reaction at the time, Turkey's former top cleric Mehmet Görmez called the bill to ban adhan a denial of Islam and Muslim existence in the territory. The noise bill would prohibit the use of loudspeakers between 11:00 p.m. and 7:00 a.m. and would officially apply to all religions. However, it is widely seen as targeting calls to prayer at mosques. Government watchdogs said the measure was an unnecessary provocation that threatens freedom of religion. Israeli President Reuven Rivlin was also among those against the bill. Back in July, Israel barred thousands of Muslims and tourists from visiting and worshipping at the Al-Aqsa mosque compound for two days. The closure was among the most serious incidents in recent years in Jerusalem; further escalating Israeli-Palestinian tensions. It took a highly unusual decision to close the Al-Aqsa mosque to Friday prayers, causing anger among Muslims and Jordan, the holy site's custodian. The mosque was closed and Friday prayers canceled for the first time since Israel occupied east Jerusalem in 1967 following a gunfight inside the compound killed two Israeli police officers and the three alleged Palestinian attackers. The Al-Aqsa mosque, known to Jews as Temple Mount, is central to the Israeli-Palestinian conflict, with Palestinians fearing Israel may one day seek to assert further control over it. It is located in east Jerusalem, occupied by Israel in 1967 and later annexed in a move never recognized by the international community. It is considered the third holiest site in Islam and the most sacred for Jews. Jews are allowed to visit but not pray there to avoid provoking tensions.